Smith contributed to capitalist theory, Chomsky is an "anarcho-syndicalist"
If you type the name "Adam Smith" into a Google search, you will find six pictures of a handsomely dressed Enlightenment gent—and one enlarged photo of a decidedly modern, bespectacled man. Smith was the 18th century Scottish economist, philosopher, and author of The Wealth of Nations, a magnum opus defending freedom and self-interest as ordering principles in social and economic relations. "It is not from the benevolence of the butcher, the brewer, or the baker, that we expect our dinner," he wrote, "but from their regard to their own interest." Chomsky, on the other hand, is a radical activist, social critic, linguist, and author of such works as Hegemony or Survival: America's Quest for Global Dominance. He once likened George W. Bush to a war criminal, adding that "his crimes vastly exceed bin Laden's." A Google spokesperson told the Washington Free Beacon that the knowledge box which appears to the right of any search is automatically generated for known people and entities based on what is available on the web. In this case, there is an error in the search and Google is working to fix the issue. While the source of the error is unknown, the spokesperson said keywords associated with source content can sometimes conflate two entities. Smith is an essential contributor to the development of classical liberalism and the rise of capitalist theory. He challenged the mercantilist view of economics that measured national wealth in terms of gold and silver, instead arguing that a nation’s wealth is found in its production and commerce. He supported free exchange rather than protectionism. Chomsky has described himself as an anarcho-syndicalist, a school of thought which, in his words, takes for granted "that working people ought to control their own work, its conditions, [that] they ought to control the enterprises in which they work, along with communities, so they should be associated with one another in free associations." Chomsky's affinity for anarchist and socialist schools of thought does not seem to square easily with the work of Adam Smith. Clicking on the enlarged photo redirects the curious browser to a video of Chomsky discussing Smith. In the video, Chomsky delves into Smith's theory of the invisible hand. The invisible hand is typically understood as a figurative way of describing how individuals pursuing their own self-interest in a free market economy will ultimately serve to benefit society in general. According to Chomsky, however, Smith’s characterization of the invisible hand in The Wealth of Nations is also "sort of a critique of what we call neoliberal globalization." He points to Smith's hypothetical example of merchants and manufacturers deciding whether to invest and import from abroad. Chomsky reads this as a critique of globalization. Smith says the merchants and manufacturers "have enough attachment to their home country they probably won’t do it if all things were equal," and so, Chomsky adds, "[as] if by an invisible hand England will be saved from what we call globalization." 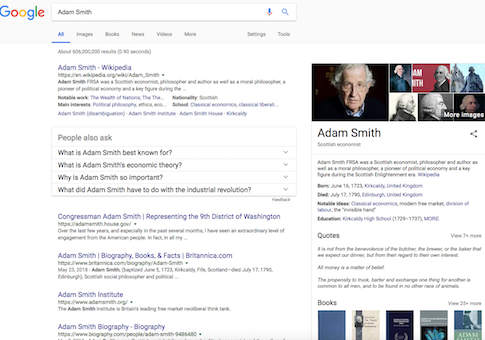 Putting aside the merits of Chomsky's interpretation of Smith, Google's juxtaposition of Smith and Chomsky is a peculiar pairing in its search engine. This entry was posted in Culture and tagged Google. Bookmark the permalink.